If your client has a fear of spiders' webs and panics at the sight (or even the thought of one) then in order to help them you will need to understand where, why and when that fear originated. Most fears and phobias are irrational. However, for someone suffering from these irrational thought processes, this doesn't really help them to overcome their fear. 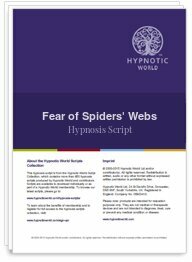 This Fear of Spiders' Webs hypnosis script from Hypnotic World can empower your clients by helping them to get to the root cause of their fear and deal with it in such a way that when they next see a cobweb they will view it in a totally different (and more positive) way.